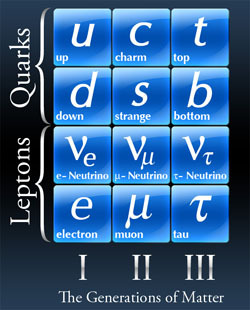 There are three "sets" of quark pairs and lepton pairs. Each "set" of these particles is called a generation, or family. The up/down quarks are first generation quarks, while the electron/electron neutrino leptons are first generation leptons. Why are there exactly three generations of matter? The generations increase in mass and higher generation particles tend to decay into lower generation particles. In the every-day world we observe only the first-generation particles (electrons and up/down quarks). We do not know why the natural world "needs" the two other generations, and we do not know why there are exactly three generations in total.